Denmark may be small and may only have 5.5 million residents, but its coastline is one of the longest and most majestic in all of Europe as it reaches into the North Sea. Located south of Norway and southwest of Sweden, Denmark is bordered on the south by northern Germany, the only other land she is attached to. Tourism in Denmark is fueled by its beautiful scenery and one of her most famous native sons, Hans Christian Andersen, the author of many fairy tales and poems known the world over. He was born in the town of Odense, which is the main city on the island of Funen roughly in the middle of Denmark. Today his house is a museum (H.C. Andersen Haus) that follows his life through his work with many interesting displays. He is such a famous part of the culture of Denmark that the place on the river where his mother washed the clothes of the rich families for whom she worked ‘The Washing Spot’ is a tourist attraction in its own right. You can still see the stone on which she stood. 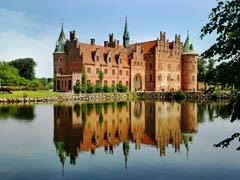 The Egeskov Castle was built in 1554 and offers travelers to Denmark a beautiful complex with not only the castle to tour, but also many museums, gardens, a 200 year old maze, tree top walking opportunities, playgrounds and fountains that will offer something for the whole family to enjoy. Tourists to Denmark and to Odense in particular can also enjoy a covered boat, Odense Aafat Aps, on a river cruise, which is a great way to see the parks and many green spaces in the town. Located in the East of Denmark is the capital of Copenhagen which not only is the largest city but also a popular cruise ship departure point and port of call on various European sailings. 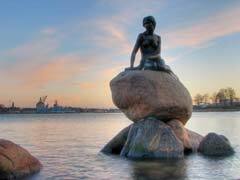 Copenhagen is also home to the Little Mermaid statue sitting in the harbor that was inspired by Hans Christian Andersen’s tale of the same name. Tourists to Denmark flock to her statue to get photographs and sit a while in the small park taking in the sights of the harbor. The Tivoli Gardens are a delight for tourists to the area as they have a vast array of flowers and plants amid the second oldest amusement park in the world. Rides operate from April to September, and are spread around the fountains, restaurants, bars and bakeries that are also part of the complex. Denmark’s tourism pull is also the many beautiful castles and churches that can be found in all parts of the country. Rosenborg Castle is a Dutch Renaissance style building with gorgeous gardens, art galleries and crown jewel displays that also shows the history of Danish Royalty through the ages. Christianborg Palace is available for guided tours through the staterooms and artifacts, tapestries and furniture of times gone by. This is also the seat of the Danish Parliament which is located in the heart of Copenhagen. Not far from Copenhagen is the quaint fishing village of Dragor where tourists to Denmark can see the cobbled streets and the blooming flowers while taking a walk to the shoreline filled with old world charm and a gentle quiet that you cannot always get in a big city. 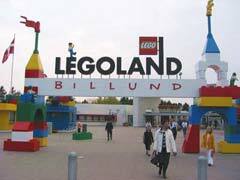 Those who travel to Denmark’s west coast town of Billund will find Legoland, the first of its kind in the world. This theme park offers entire towns, life sized sculptures, animals, and many more items all made out of these great building bricks. There are also plenty of rides, places to build and many amazing sights along the way, which makes for a great day out for the whole family. Danish tourism doesn’t stop at Denmark proper as she also governs the Faroe Islands and Greenland. Located between Norway and Iceland, and between the Norwegian Sea and the North Atlantic Ocean, the Faroe Islands offer many art galleries, old homes and museums, boat trips, fishing and many cave diving opportunities. Eighteen major islands are in the chain with boat trips and excursions to many of the uninhabited ones offered that are perfect for those wanting to bird watch or just hike around in the solitude of the day. 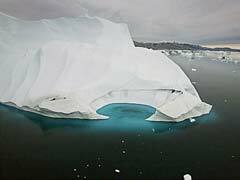 Greenland is a large landmass located to the east of the Canadian North. It is one of the best places in the world to witness the Northern Lights and is steeped in Norse history. Visitors to this ‘part’ of Denmark can enjoy arctic wildlife, coastal sailings, and Inuit culture as well as hot springs, heli-skiing, mountain climbing and hiking amid the lovely surroundings. Denmark has so much to offer the traveler, whether you enjoy fairy tales, cruises to far off destinations or historical towns with plenty of culture to embrace. If you have never thought of visiting Denmark before, perhaps now is the time.